WEM / Watkins Copicat Tape Echo Repair at JPF Amps London workshop. We had a bit of a WEM / Watkins Copicat repair extravaganza at JPF amps. Here’s a nice photo of three of the 8 (yes eight!!!) we had in for repair. 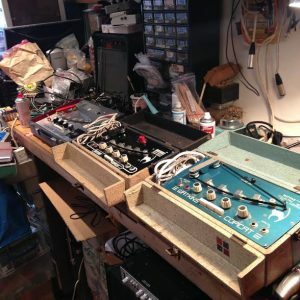 Great sound that can only really be done by a genuine tape echo. This entry was posted in Amp repair, Effects pedal, JPF Amps, London. Bookmark the permalink. Post a comment or leave a trackback: Trackback URL.